Date & Time: Saturday May 4, 7:30 p.m. Formed in 2015 by four Bay Area dancers/musicians, Cuarteto Puentes is dedicated to performing Argentine Tango music for dancers and audiences of all kinds. They have studied at Reed Tango Music Institute, Stowe Tango Music Festival, and with top tango musicians including Ignacio Varchausky, Ramiro Gallo, Hernan Posetti, Hector del Curto, Pablo Estigarribia, Emilio Solla, Adam Tully, and Ville Hiltula. The quartet appreciates the opportunities they have had for outstanding collaborations with exceptional artists at a number of unique venues. Their enthusiasm for playing danceable tango standards as well as more modern arrangements keeps them inspired with practicing, studying, and arranging. 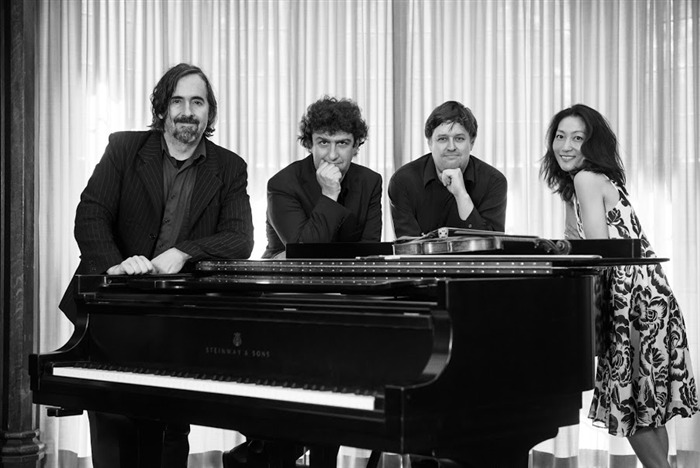 Cuarteto Puentes has appeared at many milongas (Argentine Tango dance parties) throughout the Bay Area and were featured in “live music only” tango festivals in Albuquerque, NM, and Green Valley, AZ.